Firstly, please excuse the larger than normal featured image. 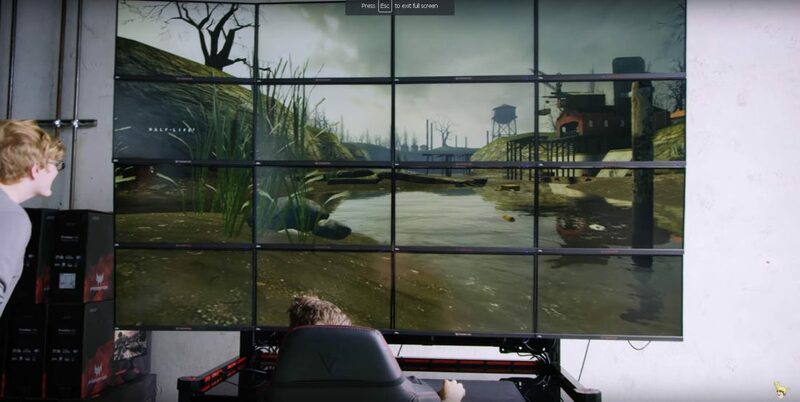 It’s Half-Life 2 running on 16 monitors at 16K resolution. You can see the full video here: GAMING at 16K RESOLUTION?? – HOLY $H!T from the Linus Tech Tips channel. Secondly, I’m back from my holiday and feeling refreshed and raring to update the site. The BlackMesaDoorVille Mapping challenge is underway and at the time of posting this chat has 16 days left. You can follow the discussion and WIP images on the official RTSL Mapping Challenges channel on the SMC Discord Server. I’ll be posting some recently released mods over the coming days too. I’ll also be re-adding the CONTACT and SUBMIT pages very soon too. I’d like to take this opportunity to reminder all users that the RTSL Twitter feed is the best place to stay up to date with all the news related to the site, including details of livestreams. Talking of Twitter, I’ve started a new daily (hopefully) tweet series called RTSL: On This Day, where I post a map or mod that was published on the site this day. In case you didn’t know, I take the map or mod from the On This Day page. It lists everything that was posted on that day, all years and all types of posts. Take a look, you might find something interesting. Other plans this month include LOTS of mapping and I want to finish Wolfenstein: The New Order and even start Old Blood. I need to catch up with your streams. Been a long time I haven’t been involved in the Goldsource modding world. I’m working on a Sven Co-op campaign with a few fellows right now. I’m trying a completely different mapping style with no textures from any official wad, but only from textures.com. Quite challenging as this is the first time for me, but I think I’m doing better. I check the ‘on this date’ every day, I’ve managed to re-build my HL and Hl2 mods directories after my hdd crashed and I list everything. Also managed to find some other gems I didn’t have before. Hey Philip, I read somewhere that you changed hosts for the website. If this is true, the new host is SO much better. When I download a map or mod, I get, on average, 1+ MB/s! Busy, busy August. Big thing here in the US of course is the eclipse on August 21st. I have a few other trips this month and really want to get a map done for the TWHL Pockets collaboration. I finished Wolfenstein: The New Order a while back and decided to finally play a bunch of Steam games I’ve had for a while just sitting around. So I’ve also managed to play and finish: Firewatch, Adrift, Cibele, and Event, which were all worth playing. Firewatch especially is recommended. I also aim to finish Tacoma, Black Mesa, and Infra soon. This is one of the hugest things in Half Life’s recent history, and I see nothing on RTSL that acknowledges it. Philip needs to make a thread about the event. After The PTSD Mod came out I’ve been trying to find the weirdest mods I can, as that kind of mod really appeals to me. I remembered two, Gateways and The Great Forever Tomorrow. So I’ll ask this question, what are the weird mods you’ve played? I’m looking for as many as I can find. Mistake of Pythagoras is said to be weird and unusual, if that’s what you’re looking for. Ignore that. I don’t know what happened but I seem to have managed to re-do it……working now…. Care to share how to get that feed (I assume RSS, which URL?) That would be cool. The two main RSS feeds are linked to in the footer. I just plan on finishing up New Vegas, The Stanley Parable and System Shock 2. Once I realized that doing Dead Space 2 on the highest difficulty gives you only 3 saves for the entire game (which is like, 16-18 hours long because the lack of supplies is going to force you to explore) I noped out of there. Ought to really start progress on that tiny Half-Life 2 map I’ve been attempting and to get places.